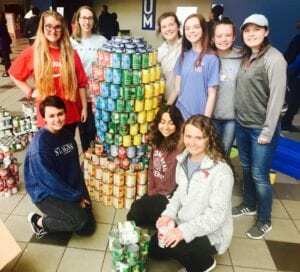 The St. Agnes Academy Canstruction team won the Structural Ingenuity Award for the second year in a row at the University of Memphis’ annual engineering Canstruction competition. The Structural Ingenuity Award, which is based on innovative structural design as shown through complexity and stability, is the Civil Engineering award for the competition. The St. Agnes team’s theme for their build was Up, Up and Away with Hunger. The team built a hot air balloon to show how, as a society, we can lift people out of the depths of poverty and hunger. The team collected 1,034 cans of food, which is equivalent to over 900 pounds of food, which will be donated to the Mid-South Food Bank. “The girls planned the design and then made alterations from the paper design to the actual build,” said David Tran, Upper School Faculty Advisor for the team. “Through trial and error, the girls determined the best way to support and balance all the cans in the structure accounting for the slight variations in the cans. They learned how to build a structure within a budget. They also learned how to balance forces to maintain structural integrity, while at the same time planning for environmental factors that could compromise the structure,” said Mr. Tran. The goal of the Memphis Canstruction Jr. competition is to increase high school students understanding of civil engineering and the role of the civil engineer in society, as well as to raise awareness about hunger in the Mid-South. The St. Agnes Academy Canstruction team won first place in the category of Structural Ingenuity at the 2019 Canstruction competition held at the University of Memphis. Pictured: (standing) Hazel Brady, Valerie Williams(co-captain), Claire Berkenstock, Claire Wallace, Madeline Tonole, Addison Hardwick; (kneeling) Veronica Thompson, Maria Thompson(co-captain), and Anna Entrekin.